Yesterday, Laura shared her recent trip to the ocean; how I envy her – and even though we have the Atlantic just a mere 90 miles away, it seems that I never manage to get there as often, if at all, as I’d like. There is, however, a peaceful oasis – the Franciscan Monastery – just about a mile and a half from my home – one I can easily walk to – and I do. On the grounds is a stately old Dogwood Tree, just inviting one to stop and savor its peacefulness in the midst of the busy city. What’s your favorite get away retreat? Enjoy it! 06 May	This entry was written by Honoré and published on May 6, 2015 at 9:15 am. 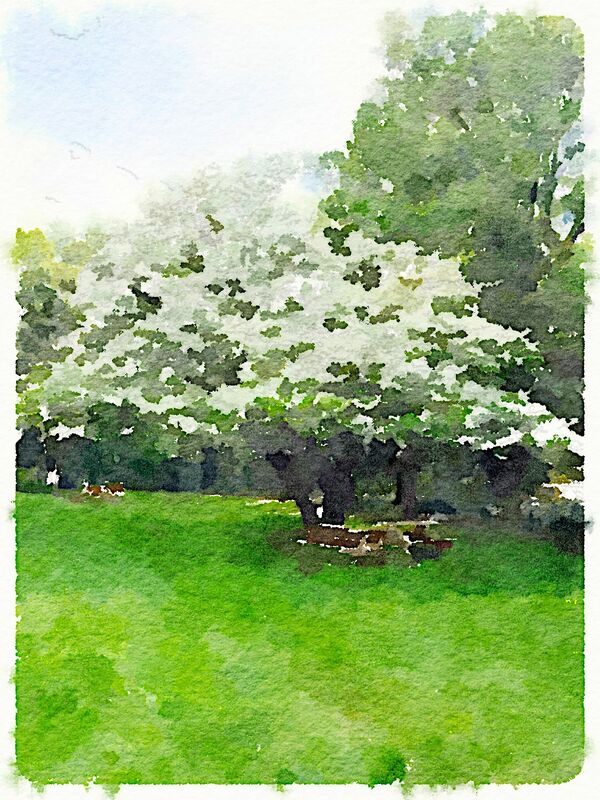 It’s filed under Honoré, Nature, Painted in Waterlogue, Self Care. Bookmark the permalink. Follow any comments here with the RSS feed for this post. Our biking and hiking trails are only ten minutes away and are so beautiful, yet we never seem to get there regularly! enjoying the reading. Everyday at lunch I go sit outside w/earbuds and phone in hand listen to good book and absorb sun rays for at least 30 min. that keeps me sane from day to day work time. My husband and I are walking everyday, the park we go to is always full of activity from kids playing, to lots of folks running, and walking the trail just to be in surroundings where people want to be is such a relief, just to know they are there to enjoy, and be free. Thank you God for the green space . …totally agree, Brenda…green space is where I breathe. Our trees are just about completely leafed out…our own cavern of living greenness. I always think of you when I look at an expanse of trees!